A Thing for Roses: Really, Me? I have recently been given a blog award by Tammy Fischer, you might remember, my new BFF. She was so kind to honor me with the "You Make My Day" award. Tammy is one of the sweetest, and funniest girls in blogland if you ask me. And talented too. Her jewelry, which I have mentioned before, is just stunning. She recently listed some new items in her Etsy store, so go check it out. Love the chippy, peely paint. I did manage to do a little makeover project last weekend that I forgot to show you. Before-ugly stool purchased at Goodwill. 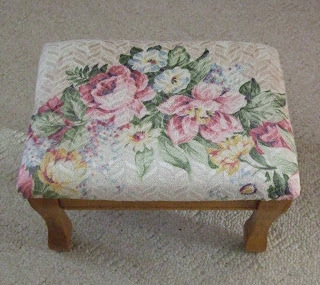 After-Lovely stool with gorgeous barkcloth cover, perfect for any shabby chic home. Gotta love that staple gun. Well, I better mosey. I need to walk this morning and then I'm headed over to Isabel's to help her load her stuff for Expo. I have to admit I'm a little bummed that I'm not doing the show too. I know with Joy and Cindy there, they are going to have a lot of fun. 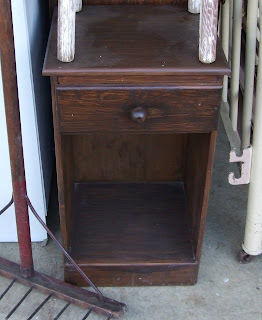 Before I forget, Cheryl at Periwinkle Vintage tagged me to tell some things about myself. I have been tagged to do this before, but am always willing to play again. I'll have to think of some good ones for my next post. I am getting closer and closer to my 100th post, so as I said before I want to do a fun giveaway. I have decided that the theme will be "Hooray for Spring!" More on this coming soon. I will be back later this weekend with pictures of my finds at Expo. Have a great Thursday! Hi Lisa! Have fun at Expo. Can't wait to see what you find. I love your finds...I wasn't surprised with the roses on the ottoman! Congratulations on your award! You lucky girl! Those were free? I love the chair and bookcase. 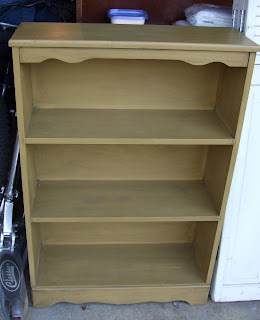 I have a bookcase just like that that is painted light green. 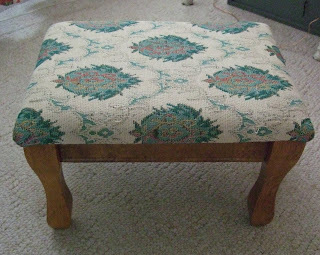 That is so funny...I bought the same ugly stool at my local Goodwill too...the exact same one with same hideous green fabric. Think they make them and then just put them in the stores? I am going to mosaic mine and give it a shabby slipcover. I'll have to share it with you when I'm done. I love you blog...love all your incredible junque finds too. Just Love your Finds ! ! I can just imagine what I would do with them. Love your Blog ! ! Your Barkcloth is lovely ! ! Come see me at my blog ! Good Thoughts to you ! Ooh, I love the garden chairs..I can imagine those painted with some floral cushions, lovely. 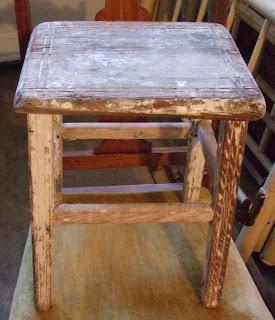 I love your stool! 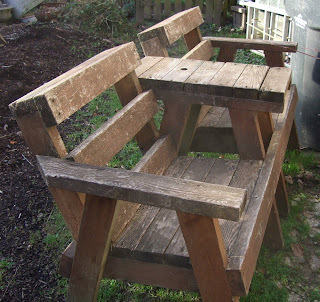 I "collect" all kinds of stools and benches I see at garage sales to cover. Notice I said I "collect", I must have about 20 of them, and have yet to cover one, but I am sure I will, as yours is such an inspiration!! 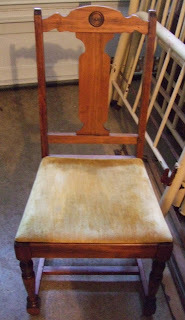 This is my 1st visit to your blog and I thoroughly enjoyed shopping for vintage vicariously through you. Fun stuff! Loved the trunk, too. Have a ball with the girls at Expo! I love your stuff, especially your bark cloth foot stool, and I LOVE your new patio piece! You have a GOOD eye!